A good figure for a cat sponsorship is £12, that way you can say 'for just £1 a month' - a lot do £15 to round it up though - ours is £12. With regards to Sams idea of contacting businesses - what about contacting them and asking them to sponsor a cat for a year? Try and get the free local newspapers involved. That way the businesses get to have an image boost and your rescue work is highlighted. Obviously, you need a rough figure for them to mull over regarding the sponsor system. PLEASE GIVE A BLACK CAT A CHANCE LOTS ARE LEFT IN RESCUE JUST BECAUSE OF THEIR COLOUR. Have popped Lucy up on the flash pages and your links in our rehoming sections. 2. Could you contact local businesses I would suggest actually knocking on doors and going into the offices. I would explain you are a local charity and are raising funds etc etc. Offer to leave a calendar for 7 days so people can see it - if people can actually see the calendar they are more likely to buy one Return in 7 days and hand over the calendars that have been paid for. 3. Door to door sales ... as long as you carry proof that you are a registered charity and have some form of ID I can't see it being a problem (obviously this depends on the type of area you are in and I would suggest going in pairs for safety and security). Will keep thinking and see if I can come up with anything else. We are on Catchat homing pages in East Yorkshire. We have Lucy on the Top cats page but still no luck I'm afraid. I am going to book a table in just about every local table top sale, Xmas fayre etc and am doing late night Xmas shopping trying to sell calendars. We unfortunately ordered 2000 as it was pre economy downturn and before coordinator's accident! Not complaining, I'm sure people on these forums have experienced it all! I'm going to keep logging in for good ideas. Hi Caring for cats. to Purrs. 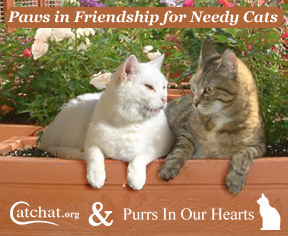 Do you have a website or pages on Cat chat we can post a link to to help spread the word about your rescue? We will try and help all we can. If you have some urgent cats in care or long timers, we can pop a flash news section up on the front page for them. It will be lovely ot get to know you and the cats in your care. Just a quick hello from us. As far as I know we're new to this part of Catchat. We are an independent charity totally self funded and, like others, being hit by the 'credit crunch' media news. More cats in the diary to be taken in and very few people coming to see them in the homing centre. We have produced a calendar (sorry, yes another one!) and this is really the only merchandise we have to sell to raise funds so if anyone has any suggestions where to promote it cheaply I would be very grateful. Our coordinator broke her foot on holiday in September and, as she has always been the most active fundraiser, very little money is coming in and the vets bills are outstanding. Sorry for the 'bad' news beginning but I am enjoying reading all the other posts about cats, especially rescues. Good to know so many are helping the kitties. The calendar should be on Ebay this week if anyone is feeling generous and hasn't bought everyone else's already! !